Smiles to start the day! Whew, sorry for taking so long everyone. It has been a trying day. Last night, Gabriella walked 2 laps down the hallway! She was worn out, but she did it! She has to walk to the bathroom now so it is quite the journey but we are learning ways to make her comfortable. Having your chest and ribs open does not exactly make for an easy recovery, especially since I cannot pick her up! This morning, she woke up a few times early. She was happy and doing well early and had one chest drain pulled. She walked the hallway, went to the bathroom and sat in a chair for a while! She had lots of visitors from our family and it wore her out. She had some smiles to give and she loves seeing everyone, but the rest of the day she spent sleeping pretty hard. We had our nurse do some teaching on everything transplant/rejection/home care while she rested, and then got her up. She pottied, walked again and was in good spirits after her rest. Everything went down the drain again though when they changed her central line dressing in her neck, arterial line bandage and cleaned her "zipper". We got her to eat a tiny bit and drink a little, but she was too exhausted. We had another teaching session on her meds and more transplant/rejection related education for another hour or so. After that, we decided to let her rest for the rest of the evening and skip her walk and she didn't want her dinner. Hoping tomorrow she will find additional strength! Everyday is one day closer to getting better, even if we do have hard days like today. We got word today that our temporary home away from home will be available upon discharge! Praise God! It wasn't going to be available for 2 to 3 weeks so we were starting to worry where we would take our family. 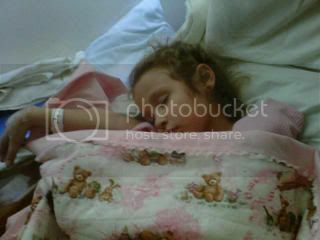 I have had a few people ask, and Gabriella will have to stay close to the hospital for 4 to 6 months. We have all the details worked out now, and will begin our temporary residency here! Oh, and a tiny milestone. 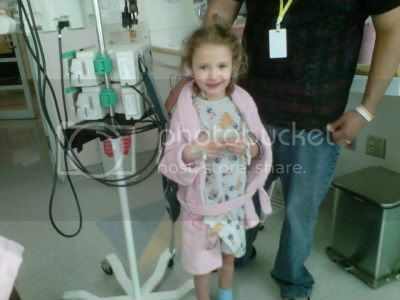 I was able to get Gabriella restarted on her Baclofen. I recently blogged about this med her rehab doctor put her on for her spastic dysarthia in her right arm due to her stroke, and it was actually working a small bit! We started the dose again tonight so we are hoping for all around progress! On that note, our night nurse just asked if she could pray with us before Gabriella went to bed. It was precious, and meant so much to us to have her pray over our Gabriella. Even days that are hard both physically and emotionally can be saved by a simple prayer. And now I am off to pray.... I have so much to praise God for. G'night all. She is SO precious, Kristi. I know this is hard, but she is making incredible progress, and she looks absolutely amazing. My thoughts are with you all. I'm thanking God for all the people He is bringing in your life right now, because they are all part of His plan! Thank you Lord for your nurse to pray over your baby girl. Love you all! She looks very good in the picture walking around. Its so amazing how quickly they get her up and moving. I hope she had a good day and days to come ! Whew! I am so glad to see this update! I was worried after hearing she was having a bad day. Gabriella looks so sweet in these photos! And I, like Lauretta am so happy that God is placing special people along this journey to uplift and encourage you all with prayer. Thank you Lord for your unfailing love,compassion and mercy!